Since 1982 WIKA has been a member of the German Calibration Service (Deutscher Kalibrierdienst - DKD), the calibration laboratory and the mobile calibration service have been accredited by the German accreditation body (Deutsche Akkreditierungsstelle - DAkkS) to DIN EN ISO / IEC 17025. Thus, with WIKA, you can be sure that a calibration and the generation of a calibration certificate is always carried out in compliance with legal and normative requirements and also on an internationally comparable level. In measurement technology, calibration means determining the measuring deviation of the respective measuring instrument. In contrast to adjustment, in calibration there is no intervention with the instrument. If an indicating measuring instrument is calibrated, the measuring deviation between the measured value display and the actual value is recorded. For material measurements, for example masses, the difference is determined between the marking and the actual value. For measuring chains, one determines the deviation between the value of the output signal and the value that the signal should have with an ideal transfer characteristic and a given input value. 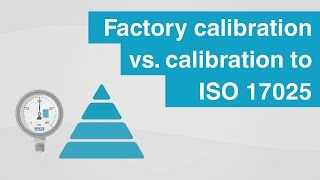 In the DIN EN ISO 9000 and the DIN EN ISO / IEC 17025 family of standards, traceability to national standards is required for a DAkkS calibration. With traceability, the measured value display (or a material measure) is compared with the respective standard for the measurement parameter. The German physical and technical test institute (Physikalisch-Technische Bundesanstalt - PTB) is the highest technical authority in Germany for metrology. The PTB maintains and develops the national standards. It ensures the international comparability through cooperation with other national institutes. Through a DAkkS calibration of measuring and test equipment and the traceability of measurements to national standards, reliable acquisition of process variables is ensured. 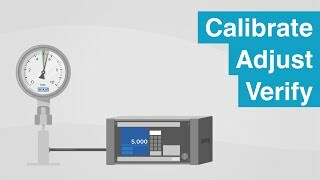 A DAkkS calibration by WIKA thus contributes directly to safeguarding your product quality. The result of the DAkkS calibration is recorded in a calibration certificate. Through the European co-operation for Accreditation (EA) it is ensured that your calibration certificate will also be recognised in other countries. We generate calibration certificates for the measurement parameters pressure, temperature, DC current, DC voltage and DC resistance. We would be happy to generate a calibration certificate for your measuring instruments as well. Please use our form for (re-)calibrations.